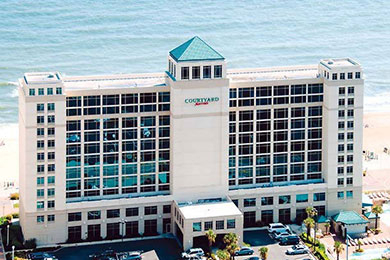 During the winter, Courtyard by Marriott Virginia Beach Oceanfront/North 37th St. is mainly frequented by business travelers; families intermittently visit for cheerleading competitions, soccer tournaments and the like, held at the nearby Virginia Beach Convention Center. During the summer, however, beach-bound families take over entirely, and we know exactly why. With one look around the hotel’s spacious, inviting lobby, you’ll be pleased, especially since it’s attached to The Bistro, a casual, grab-and-go cafe. You’ll also appreciate The Bistro’s surrounding space to eat or simply relax on one of several cozy couches, conveniently located beneath a flat-screen TV. Past The Bistro and through a short hallway, you’ll step outside to find a large pool (it starts at the side of the hotel and wraps around a portion of the front) with waterfalls and a lifeguard on duty. Back inside, an elevator will take you to your room, where you’ll discover a balcony that overlooks the beach. 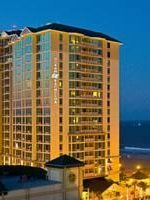 And if you hadn’t figured it out already, this is the point you’ll discover you made the right choice for family-friendly accommodations in Virginia Beach. Learn more about Courtyard by Marriott hotels. 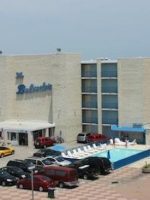 The hotel has a total of 161 rooms and suites in five different styles. Each one is furnished and decorated in maroon, beige and brown palettes, and features a balcony with picturesque beach views. Other amenities include mini refrigerators, coffee and tea makers, desks and iron and ironing boards. Suites have microwaves and small tables with a few chairs, perfect for playing board games. All bathrooms provide shower and tub combinations (except the 1 King Oceanfront Whirlpool rooms, which aren't ideal for families anyway). For families of four, the 2 Queen or 1 King, Sofabed rooms are perfect. If you have a family of five, you can still stay in these rooms (though it might be a bit cramped) with the use of a rollaway bed or Pack n' Play, which are available upon request and free of charge. Keep in mind that these units do not include refrigerators. If you'd like to store snacks and drinks during your stay, you need to book a suite. If you have a group of six or seven, book a 1 Bedroom Suite, which has two queen beds and a sofa bed. For a little more space (672 square feet; the 1 Bedroom Suite is 600 square feet), reserve a 1 Bedroom Larger Suite. 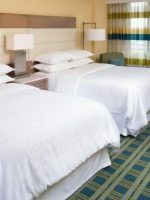 Connecting units and handicapped-accessible rooms are available. I stayed here from Jacksonville for a military training session from January to March and had a great great experience even with cold weather. My room was fantastic and all the staff was great.Ms.Lisa Patterson was exceptional and professional to the highest degree! Great friendly positive vibes made me feel at home and always made sure to address all visitors including myself in a kind friendly manner and addressed any needs for my room.She was terrific!definitely will stay here again! I stay here every summer for a week with my family. Definitely some wear and tear in the rooms, but no more than expected for a beach hotel. Location is excellent, staff is great and price is reasonable. The beach is your background, and you'll obviously want to enjoy it. When the kids need a break, however, you can head to the hotel's outdoor swimming pool, which is five feet deep and winds around a small portion of the property. It also features several waterfalls. The pool is open on weekends in May, from 9 a.m. to 5 p.m., and then every day from Memorial Day through Labor Day, 9 a.m. to 10 p.m. After that, it reverts back to a weekend schedule, with hours from 9 a.m. to 5 p.m. A lifeguard is on duty. If you need a break from the sun, go for a swim in the indoor pool, or relax in the hot tub. Be aware that there isn't a lifeguard here. 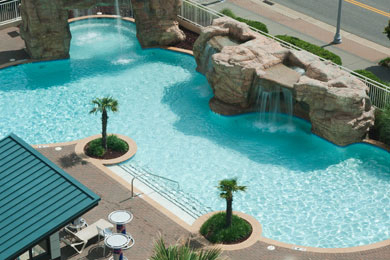 This pool and hot tub are open year-round, from 8 a.m. to 10 p.m. daily. Both pools are ADA compliant. 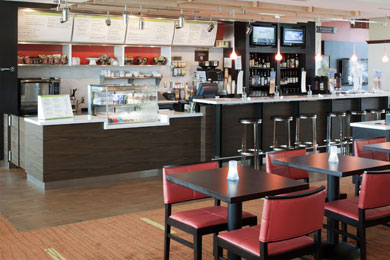 The Bistro, surrounded by high-top tables, booths and couches, serves grab-and-go items for breakfast and lunch. Breakfast includes omelets, French toast, sandwiches (probably the most popular item), parfaits and smoothies. The Bistro also serves Starbucks coffee. For lunch, you'll find salads, sandwiches and burgers. Appetizers are also available when you want a small bite to eat, and include wings, flatbreads, quesadillas and veggies with hummus. Additionally, the Bistro features a bar with a decent selection of beers, from domestic to craft brews. Seasonal specials are offered on both the food and drink menus. The Bistro is open from 6:30 a.m. to 10 p.m. daily, year-round. 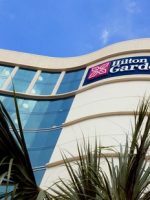 Since the Courtyard by Marriott chain is an official sponsor of the NFL, the cafÃ© also provides complimentary popcorn during football games, which can be watched on several flat-screen televisions around The Bistro. During the summer, the hotel offers a breakfast buffet (for a small fee per person), which is a hit with families. Traditional offerings include eggs, bacon, sausage, waffles, cereals, fruit and pastries. The buffet is available from 7:30 to 11 a.m., and closes after Labor Day. High chairs and booster seats are available. Additionally, there is a pool bar (next to the outdoor pool), which serves snacks, lunch and dinner. It is open Memorial Day through Labor Day, from 11 a.m. to 8 p.m. Located next to the lobby and near the elevators, a small pantry offers snacks, sodas and even single bottles of beer. The pantry operates 24 hours a day, but beer can only be purchased until 12 a.m. You can have the items charged to your room. The hotel provides a fitness room, located on the 2nd floor, with a few cardio machines and free weights. All cardio machines have flat-screen TV's, and complimentary ear buds are provided. In the lobby, you'll find a few computers, available for complimentary use. 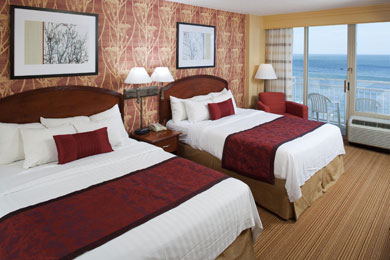 The hotel houses an event room for up to 120 people, and with views of the beach, it's perfect for a family reunion. The hotel doesn't provide babysitting services, nor does it have recommendations, as this is a rare request. Virginia Beach is a summer destination, busiest from May through Labor Day. The crowds -- and the rates -- lessen after kids go back to school, but most area hotels, including Holiday Inn and Suites North Beach, sell out on weekends through Columbus Day. This is mainly because of large events, including the Virginia Beach Neptune Festival and the Mid-Atlantic Shrine Association Convention. You'll find the lowest rates during the winter, but you also won't find much to do, as many attractions and restaurants are seasonally operated. The closest airport is Norfolk International, which is approximately 30 minutes from the hotel. 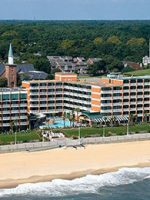 Take a taxi or the airport shuttle (operated by James River Transportation and located in the Arrivals Terminal) to Virginia Beach. Most Virginia Beach vacationers come from the Mid-Atlantic. If you're one of them, you'll likely have to cross the Chesapeake Bay Bridge, which stretches 20 miles and requires a toll. Credit, debit cards and E-ZPass are accepted for payment. One downside: Onsite parking is available at the hotel, but requires a per day fee during the summer. It's a minimal fee, but other area hotels don't charge for parking. Complimentary valet service is available. Avoid more parking fees at meters or garages by walking. 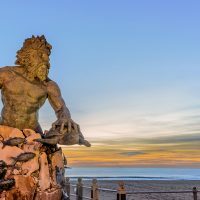 Virginia Beach is easy to navigate by foot, since it has a well-kept boardwalk that stretches 40 blocks along Atlantic Avenue. 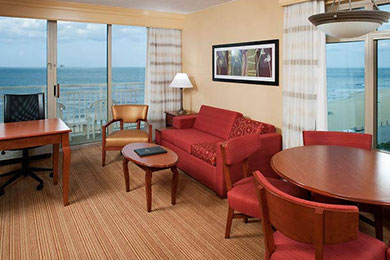 Walk one block to Isle of Capri, located in the South Tower of Holiday Inn & Suites North Beach. 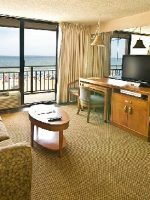 We love it, as do several employees at Courtyard by Marriott Virginia Beach Oceanfront/North 37th Street, who profess it has some of the best food in Virginia Beach. Floor-to-ceiling windows with views of the beach add to the already elegant setting, which necessitates Business Casual attire. Italian dishes are served in generous portions and include traditional favorites, such as chicken marsala and lasagna, along with a selection of specials, soups, salads and appetizers. Reservations aren't accepted, so go for an early or late dinner. If you have to wait, relax with a few drinks at the bar.